But when a protective friend comes back into Erin’s life, he insists that Shevaun is a vampire who actually exists apart from Erin. Shevaun has dangerous allies, like the handsome witch Adjila – and they’re determined to sever Shevaun’s connection to Erin once and for all. The last book I read was Persistence of Memory, by Amelia Atwater-Rhodes. I absolutely worshiped her when I was growing up, cause, y’know, 13-year-old author, wrote about vampires, etc, etc. Her fictional world shaped mine as a child, and still kind of does, to some extent. Anyway, that being said, Persistence of Memory was kind of disappointing. I mean, the premise was promising – a girl who all her life has believed that she is schizophrenic and has a violent alternate personality named Shevaun, comes to find out that her alter is in actuality a real person vampire who occasionally inhabits her brain. It’s a very unique way to approach the usual human-gets-introduced-to-supernatural-world plot point. And I liked that her illness was taken seriously and dealt with (as far as I can tell) realistically by the character and the author. You can see that Amy did her research, or maybe she knew someone with similar problems. I believed it, anyway. Still, there were issues. I mean, coming on the heels of the massive world-building she did in the unique and immersive (if overly edited) Kiesha’ra, the setting and situations in this story come off a little bland and boring. We’re back to plain old vampires and plain old humans, and while there are shapeshifter and witch characters in this book, it feels…less imaginative. 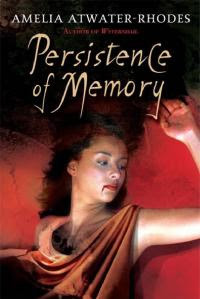 The only bit of interesting mythology we get in Persistence of Memory deals with the Triste witches (basically immortal psychic vampires with magic powers), and most of that you can learn from her website, blog, and message board, which I happened to spend my early teen years living on. I suppose all that is forgivable, since the point here is the story and characters, not the world. But…well, the characters aren’t that great either. Erin is boring, basically the same heroine Amy has in all of her books – an attractive, sarcastic loner. Even her mental health issues don’t affect her personality enough to make her interesting, or even all that different. Her alter’s lover, Adjila, suffers from the same problem. You could call him Zane or Jaguar or Nikolas or Christopher, or hell, even Aubrey, and never know it should have been different. The villainess Pandora = Jeshikah = Fala = Araceli = Dominique. No difference but her species. The only real exception to the rule of been-there-done-that is Erin’s love interest Sassy. He gets a few and differentiating and truly lol-worthy moments in there, being a shameless but charming compulsive liar whose stories change every time he tells them. But he’s the only one. Then there’s the other protagonist of the story, Shevaun. URGH. Shevaun annoys me, because she is less a character than she seemed to be an experiment in creating a morally ambiguous protagonist with the least subtlety possible. I mean, the woman eats puppies. I’m not even exaggerating for comedic effect, she literally EATS PUPPIES. In the middle of the book, she says – totally seriously – “Hmm, speaking of puppies, I’m hungry, let’s go get one for lunch.” OH HI EVIL PERSON. Yet – and SPOILERS FOLLOW, LALALALA, SPOILERS – you come to find out that the whole reason that this connection between her and Erin came to be was because she accidentally ate and killed a pregnant woman, then went crazy with remorse because OH MY GOD I KILLED SOMEONE EVEN THOUGH MY VAMPIRE FAMILY AND I HAVE ONLY RAZED CITIES AND MURDERED LIKE THOUSANDS OF PEOPLE, LIKELY INCLUDING OR AT LEAST LEADING TO THE DEATHS OF WOMEN AND CHILDREN. But because preggers CROSS THE LINE or something IDK, she had her witch lover, Adjila, try and save the woman, which unintentionally created a psychic link between Shevaun and Erin, the unborn baby. feeling remorse for killing anyone, even an expectant mother. I just don’t. Eating puppies makes you a bad person. A cartoonishly bad person. End of story. I’m all for moral ambiguity, but only when it’s pulled off well – and it’s not here, so we get this huge plot point and last-minute character turn that together squander what was left of my suspension of disbelief. Oh, and to add to the spirited trampling of reality into my childhood fangirling, Alexander, previously seen in my dearest In the Forests of the Night, stops by to act like the whiny douche I never imagined him to be. So yeah, iiit wasn’t that great. I’ve come to realize that Amelia’s greatest strength lies in the unique world that she’s created, and prior to this, every book she’s written has introduced us to some new facet of that world; that’s what makes them so readable. But world aside, the characters are bland and interchangeable, the writing is…a bit juvenile, and for the most part, the stories themselves are boring. Run of the mill. Been there, done that before. Blandy McBlandBland. And without the crutch of world-building to hold it up, you can really see it in this book. Ah, the shattering of childhood illusions. GOOD TIMES. Are you really sure this is a “Don’t Read”? Those are the only two RAD things about the book. The rest is SNORE CITY. I read Atwater-Rhode’s books when I was in Jr high. Picked up this book for a quick read/feeling nostalgic. Shevaun was so annoying! She supposedly calmly contemplates and doesn’t feel human emotions anymore, but flies off the handle and rages. She’s compassionate while choosing her prey, but destoys entire villages/empires/ a sixteen year old, mentally ill girl. I’m just really disappointed.